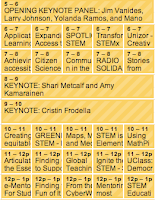 There's a way to follow the first online GLOBAL STEMx EDUCATION CONFERENCE for everyone! "The Science, Technology, Engineering, and Mathematics acronym is no longer adequate, as it is missing well over 20 letters that represent key skills & disciplines. 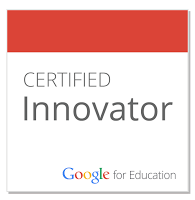 As such, x = Computer Science (CS), Computational Thinking (CT), Inquiry (I), Creativity & Innovation (CI), Global Fluency (GF), Collaboration ( C ), ...and other emerging disciplines & 21st century skills." The online conference, free of charge, will be held round-the-clock starting September 19 at 11am PST and ending on September 21, at 2pm PST. Here are seven ways to keep up with STEMxcon. If you're like me, you'll be checking out more than one option. 1. First of all, you're going to want to add the STEMx calendar to your Google calendar. The offerings are quite varied, with several keynotes. Go to http://stemxcon.com/page/attending-schedule → click on Google Calendar at the lower right → Add to calendar. 2. If you want to join in the conversation and be in the thick of things, sign up to chat on the STEMxcon site. 3. Love up-to-the-minute thoughts and reactions to the presentations? 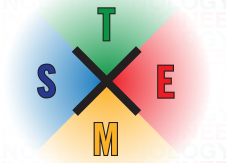 Follow @stemxcon on Twitter and/or follow the hashtag #stemx13. TweetChat is a nice way to follow. No sign-in necessary. If you prefer Twitter highlights, Stem News and Beyond curates tweets in paper.li newspaper format. 4. Are you a Facebook fan? Like STEMxCon on Facebook. More than 17,000 have liked the page so far. 5. 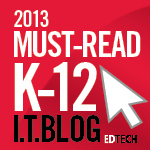 Love sharing resources via social bookmarking? Apply to join the STEMxCON Diigo group. 6. 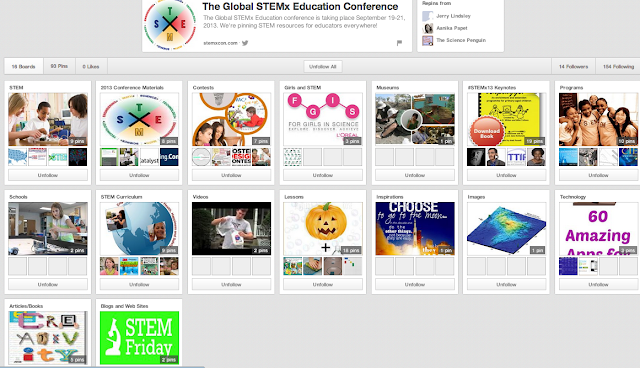 You can follow GLOBAL STEMx EDUCATION CONFERENCE on Pinterest. Pinterest is my personal favorite because the pins are specially picked and tend to be the crème de la crème resources. Also, the collection of resources will continue to grow after the conference is over. Best of all, I'lI be able to browse through the boards at my leisure. 7. I'm surprised that there's very little on Google+ at the moment, other than a few announcements about the conference. 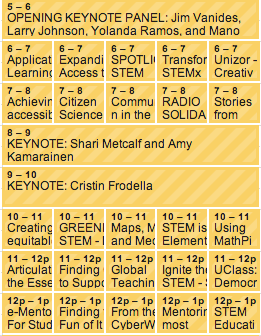 I'm hoping the hashtag #stemx13 will turn up on the network, come September 19. Whichever way you choose to follow the GLOBAL STEMx EDUCATION CONFERENCE, don't miss this chance to participate!